"The condition in which prisoners are kept simply has not been a matter of sufficient public inquiry or interest." So said United States Supreme Court Justice Kennedy, concurring in the majority opinion in Davis v. Ayala, 135 S.Ct. 2187 (2015). Justice Kennedy is certainly correct, but if the current state of law and politics are any indication of the likelihood of an inquiry into prison conditions at any point in the near future, he should not hold his breath. This is so because the primary watchdog of U.S. jails and prisons is the court system itself. And according to Marie Gottschalk in her excellent book Caught, Congress and the courts have spent the last three decades "stripping away" prisoner protections and greatly restricting prisoner access to courts. One of the ways that lawmakers and courts have hamstrung prisoners is by requiring them to jump through copious hoops prior to accessing the court system in order to complain of any matter. In practice, this means that prisoners must comply with prison rules to the letter in order to perfect a complaint. In every prison system, the first (and most likely to be tripped up on) step is the grievance system. No matter what the issue, a prisoner must exhaust his administrative remedies prior to filing suit. In theory, this requirement allows the agency to deal with the issue in a less formal, more cost-effective manner. In reality, it prevents prisoners from accessing the courts to complain of everything from assaults at the hands of guards to substandard medical care. Prison grievance systems are not uncomplicated. A prisoner who wants to understand his rights and learn how to navigate the grievance system properly should pick up Dr. Terri LeClercq's terrific book, Prison Grievances: When to Write, How to Write. LeClercq, a Professor at the University of Texas School of Law and author of several legal writing texts, uses a unique graphic novel format to reduce the Texas prisoner grievance system to an understandable and workable process. The story itself follows a volunteer lawyer teaching prisoners how to properly file grievances. By the end of the story, just about every conceivable use of the grievance system is covered. 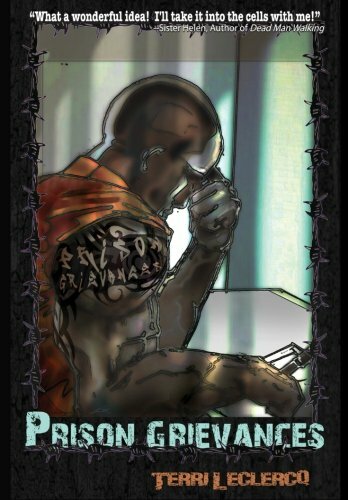 Prison Grievances is more than a graphic novel, however. The second half of the book contains several worksheets and checklists designed to aid a prisoner in using the grievance system. Prisoners will learn the ins and outs of protesting inappropriate disciplinary sanctions, excessive use of force, excessive heat or cold, environmental hazards, interference with mail and publications, interference with religious rights, and improper medical care. Prison Grievances unique combination of graphic novel and self-help book should be on every prisoner's bookshelf. When the time comes to seek redress for wrongs at the hands of prison administrators, you'll be ready to get your complaint right and keep the door to the courthouse wide open.